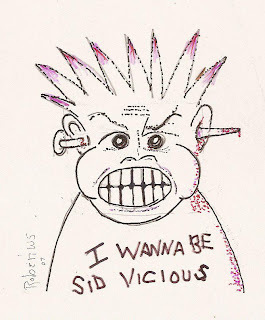 I still come across a few people who think Sid Vicious was signifigant, though he's going to be less than a molecule in pop music history as time goes on. This cartoon was drawn for a music zine of the time, though not in color. I still think its funny, even if the subject has gotten obscure. Redrawn from a sketch, as the original is in someone else's hands, or the wastebin of time.